Keep your AED cabinet safe whether it is placed indoors or out. Cabinets come in a variety of sizes, materials and with or without an alarm. We also carry signage and posters to ensure your AED is noticeable and the person using the device knows how to use it properly. Shop cabinets and signs to fit your specific needs below. 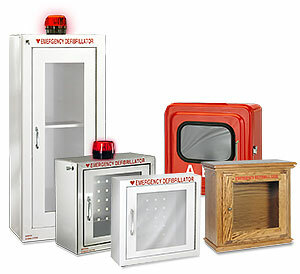 AED wall cabinets keep your defibrillator stored in a safe but visible location. We offer defibrillator cabinets with audible alarms, strobes, and even ones made for outdoor use. Made of high quality components right here in the USA, you can count on your AED cabinet lasting for years. 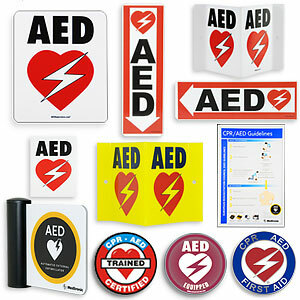 AED signs and wall decals show clearly where your AED is located for emergency use. Our defibrillator signs come in a variety of sizes, shapes, and colors, including magnetic, vinyl, plastic and all weather AED signs. We also offer defibrillator posters to educate potential rescuers.